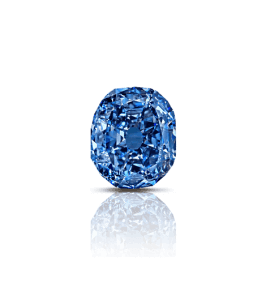 Blue diamonds have captured the world’s attention time and time again. They are quite rare and each is unique in terms of hue, clarity, carat weight and value. 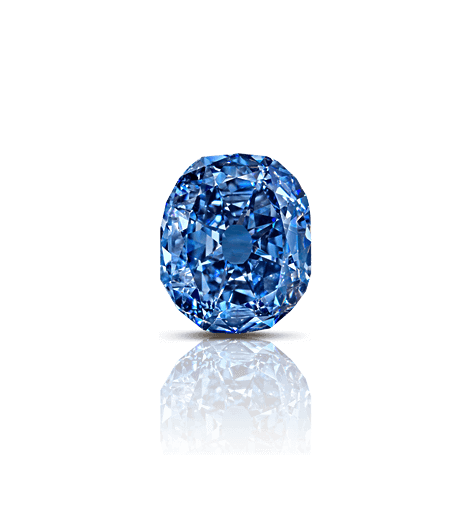 Shortly following the auction of the famous Blue Moon diamond, we decided to take a look back at the most famous, coveted blue diamonds in the world. Just a warning, it may be hard to go back to colorless diamonds! It’s one of the most famous diamonds in the world and one of a kind. When it was donated to the Smithsonian by Harry Winston in 1958, he sent it via Registered Mail. Obviously priceless but often given a value of $250 million. The Heart of Eternity was discovered in the Premier Diamond Mine in South Africa and cut by the Steinmetz Group for De Beers. The gem was unveiled in January 2000 as part of the De Beers Millennium Jewels collection at London’s Millennium Dome and was later shown at the Smithsonian. In a private collection, if it were offered at auction, the estimate would be more than $3 million per carat, or $80 million. A diamond with a history as rich as the Hope, The Wittelsbach was mounted on the crown of the King of Bavaria until 1918. 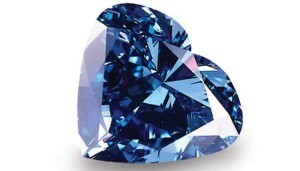 The large blue diamond broke records when Graff bought it for $23.4 million in 2008. 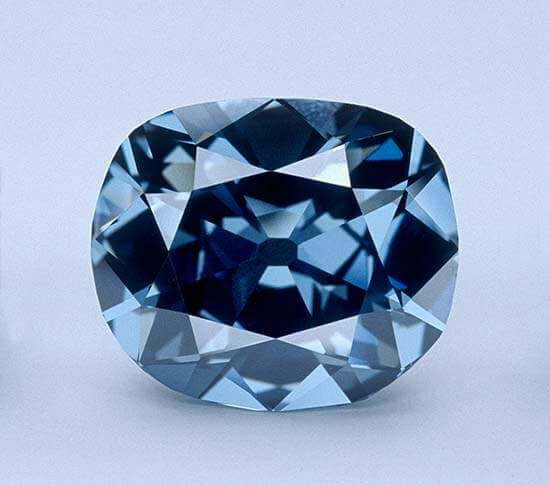 He promptly recut it from 35.56 carats to improve its brilliance and color. That price now looks like a bargain. Today, we’d put an estimate of $80 million. Acquired by Graff in 1984, the Imperial Blue is the world’s largest known Flawless Fancy Deep Blue Diamond. What it lacks in provenance and color intensity, it makes up for in size. 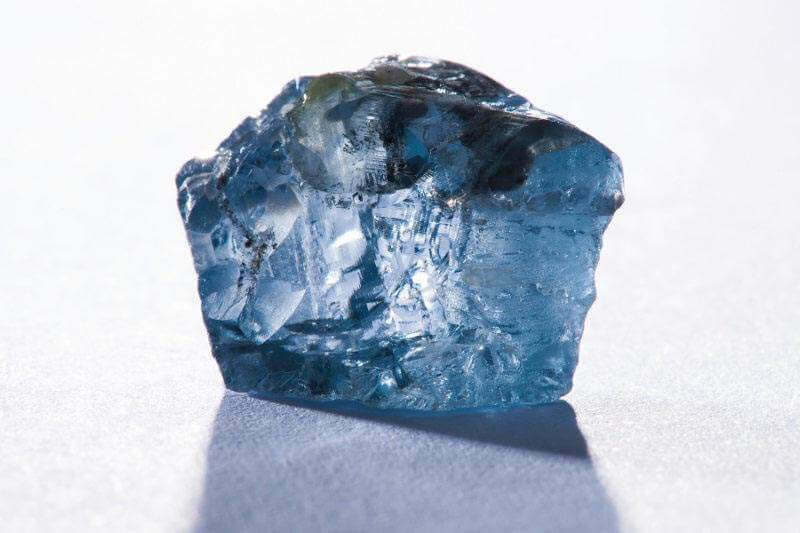 At $2 million per carat, it would command a reserve price of $79 million. Found in the Premier Mine in 1908. After several owners, Marjorie Merriweather Post purchased the ring from Harry Winston in 1960 and donated the stone to the Smithsonian in 1964. 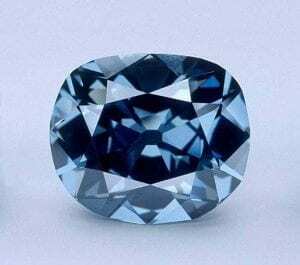 The diamond is sometimes referred to as the “Eugenie Blue,” but there is no evidence that the Empress ever owned it. 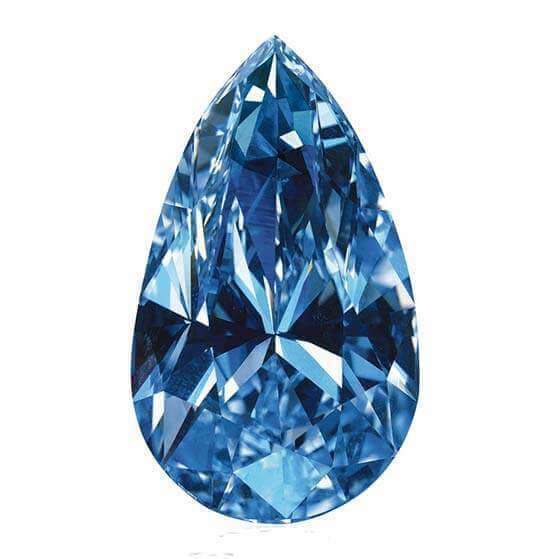 Based on recent blue diamond record prices, a value of $61 million seems quite conservative. The Blue Moon is the most expensive diamond sold at auction, selling for a record price of $48 million, or $4 million per carat at Sotheby’s on November 11, 2015. This record-setting gem is a brighter, smaller version of the Hope, with a cushion shape and a riveting presence. It shares something else with the Hope: it displays strong red phosphorescence after exposure to ultraviolet light. Originally known as the Tereschenko Diamond, the pear-shaped diamond was purchased by Robert Mouawad for $4.6 million at Christie’s Geneva sale in November 1984, at the time the highest price ever paid for a diamond at auction. It would receive an auction estimate for more than ten times that price today. The Zoe Diamond held the record price-per-carat for a diamond for a year. 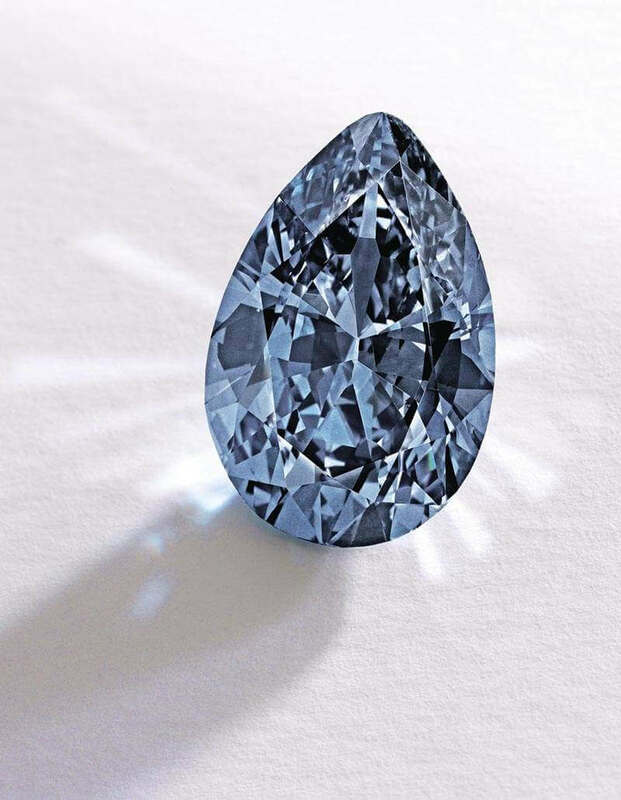 From the collection of Mrs. Paul Mellon, the pear-shaped gem sold at Sotheby’s New York for more than $32.6 million in November 2014, shattering its high estimate of $15 million and setting record price for a blue diamond. That’s more than $3.3 million per carat, making it a world auction price-per-carat record for any diamond at the time. Once owned by Abdul Hamid II, the 34th Sultan of the Ottoman Empire. Purchased and sold by both Harry Winston and Laurence Graff, it starred in many ad campaigns for both brands. In private hands, its value is also a mystery. Although its color is light, its size is impressive so auction estimates would begin at $30 million. Although this perfect pear is fancy vivid blue. 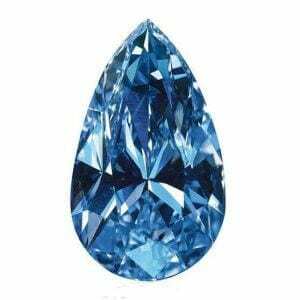 internally flawless, and 13 carats in size just like the Blue Moon diamond, it is less saturated in color, showing the individuality of fancy blue diamonds: each has its own hue and personality. 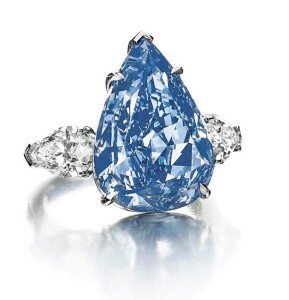 The Blue sold to Harry Winston at Christies on May 15, 2014 for $24 million. When is the Best Time to Sell Your Diamond? What is a GIA Diamond Grading Report?